Hi from London! We arrived here on Sunday morning and quickly got to it. We went for a long walk to a local park and played and had so much fun in the water features and choo choo train playground. Another nice walk and a pub stop, then back to the house to grill for dinner. William and Henry did wonderfully on the flight, which made for a much easier first day in London than we were expecting! We are off to Lisbon tomorrow and wanted to share what we are planning on taking for the next week. Be sure to follow along on social media as we travel through Portugal! earrings: Love these triple hoop earrings- so fun for vacay! hat: We always like to have a sun hat when we’re spending so much time outside. sunglasses: Sunnies are a must have for this trip. dry shampoo: We don’t know about you guys, but we hate to waste time shampooing and blowdrying while we are on vacation! lemon one piece swimsuit: This is the cutest one piece we’ve seen this season. sunscreen: A must have for a summer vacation and we love this one. embroidered skirt: This skirt is so cute and so much fun because it also doubles as a top. pineapple midi skirt: The cutest midi skirt for summer! lace up sneaker: These sneakers are so perfect to wear with any summer outfit from jeans to shorts to dresses to skirts. striped pajamas: Pjs for a getaway are a must in our book. studded slide sandal: Love these rockstud lookalikes. yellow rattan clutch: This cute clutch works with most of our outfits for this trip. lipstick: A fun summer color is always a good idea! foundation primer: We absolutely love this primer! eyelet tunic: This is the perfect coverup/beach lunch tunic. Tomorrow we are headed to Del Mar, California for a fun little getaway. We are taking the boys to the beach and we’ll also be celebrating our cousin’s high school graduation! We have a lot planned for a quick getaway. Last time we were in Del Mar, Stia was pregnant with Henry – she can’t wait for his first time to experience the beach and a place that’s so special to us! yellow woven clutch: Love the sunny yellow of this cute clutch. straw sun hat: A hat is a must for the beach and this one is perfect – we’ve had it for years! tiered tie back top: A summer top with the cutest tie back. heart sunglasses: We found these designer knockoffs for $10 and they are great for the beach or pool and playing with toddlers – no worries if they get lost or broken! striped ruffle bikini top and high waist bikini bottom: Loving these high-waited bikini bottoms for summer. paisley maxi dress: This pretty tropical print dress is perfect to wear to dinner. 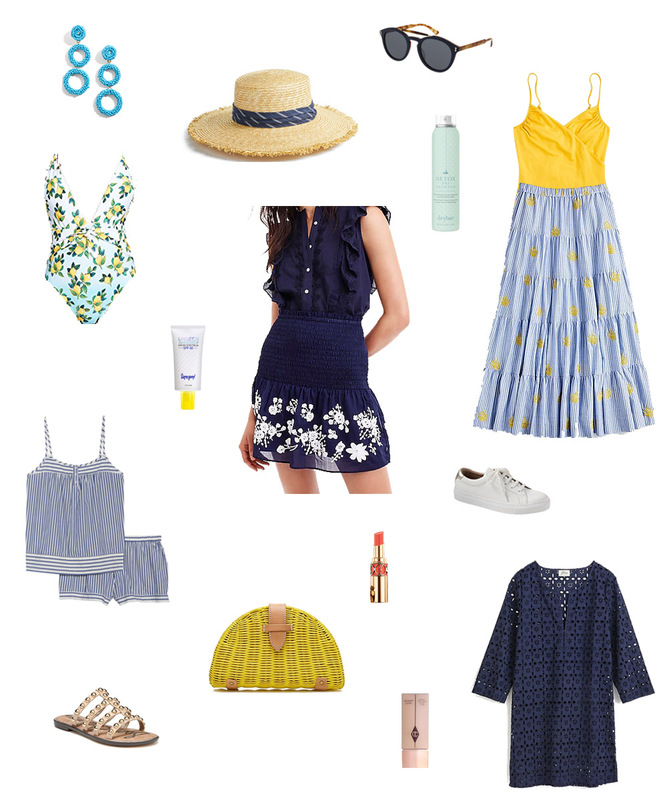 denim shorts: A must have for a summer beach trip! tassel earrings: Love these pretty pink statement earrings! Tory Burch flip flops: These are so cute and such a great price- we want them in every color! Colleen Rothschild discovery travel size kit: Travel size essentials in one of our favorite skincare lines, perfect for traveling- use our code BH20 to get 20% off any regular priced CR products! Also, Neiman Marcus NorthPark is hosting a Colleen Rothschild pop-up shop all day Saturday June 9th- Colleen herself will be there from 1-4 giving custom skincare routines and recommendations. Be sure to stop by if you’re in the Dallas area! gingham pajama set: This green gingham pj set is adorable! circle straw tote bag: The perfect bag to take us from brunch to the beach. lip gloss: This lip gloss will for sure be in our beach tote! 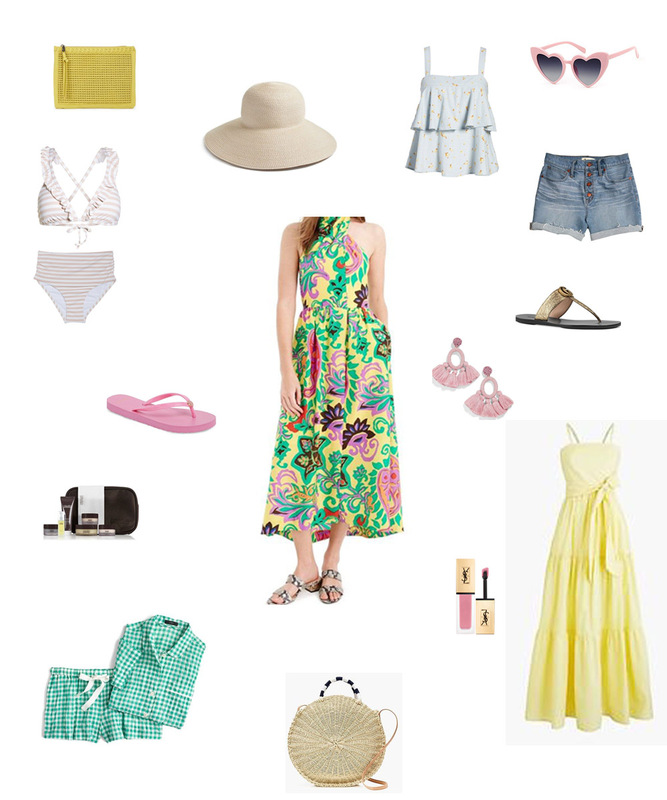 yellow ruffle maxi dress: A maxi dress that’s great for a shopping day or for going to dinner.